These simple butterflies will Flutter right into your Heart! Okay, that was corny. 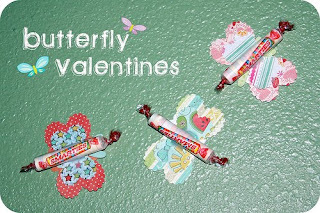 LOL I bought a bunch of smarties the other day for Valentines and needed to be creative with them. Anne had a great idea with Suckers & Flowers! Check those out too! I used hearts as well. But instead made them into Butterfly wings. My kids loved how they turned out. First, Take your cutting tools ( I used two different sized hearts and a oval shaped tool to make these ). You can find these tools at any craft store. Most of the time on sale. Or you can get creative with scissors if you don't want to use the tools. 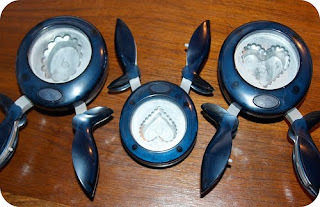 Parents: Cut out 2 large hearts, 2 small hearts and 1 oval shape for your butterfly. Use different colors for your cutouts to give it some personality. 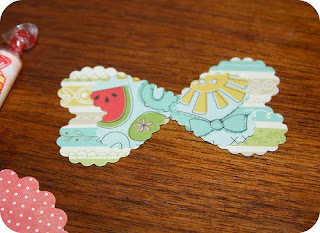 Tip: Moms and Dads: to hurry things along, have all your pieces cut and ready to go for lil ones to put together. Next, Place the small hearts on top of the large hearts and secure in place with tape. 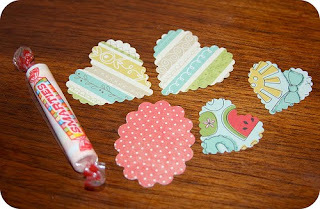 You will also want to tape the top and bottom so all the hearts stay in place. 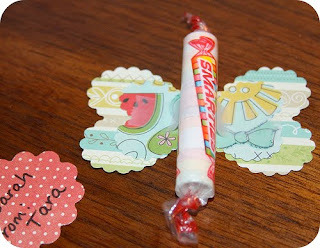 Next, Tape your candy on top making the body of the butterfly. Just tape right on the front with clear tape. No need to tape on the back. It stays in place pretty good. Let's finish up.... Take your final cutout ( the oval shape ) and have your child write the to and from. Tape to the back of your butterfly. 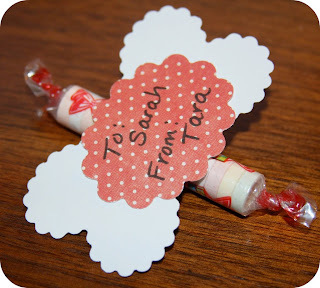 Make a bunch of these cuties for friends, family, teachers, neighbors, ect. You kids will love how simple they are to make. So so cute! What a great idea! Love the cutting tools!! Would save me lots of time!!! what a cute idea - I may borrow your idea next year! my son is almost done making his for his friends for our party. I love your idea - VERY cute! I love this idea - I wish I would have seen it sooner. 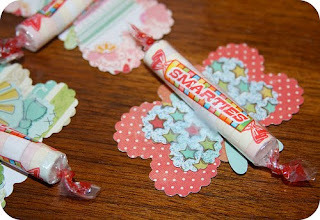 I was trying to think of something that looked nicer than gluing a Nerds box on a card! That is so cute. I kind of made something like that. I am posting about it tomorrow. Have a great day.. Thanks again for playing along.. Happy Valentine's Day..
how cute! might try this with the boys this weekend....dropping by via Amy's round robin.